As April gave way to May in 2015 Canadian politics suddenly shifted. The Liberals had been in a slow but modest decline, the Conservatives in a slow but modest ascendancy. However, it was the NDP that made a big move by winning a convincing majority in the May 5 Alberta election. The radical transformation of Alberta politics appears to have had a profound, catalytic and transformative impact on the federal scene, moving voters from both the Conservatives and the Liberals to the NDP. Partly it is the sheer momentum impact of the victory, but it appears the unexpected outcome suggested to many whose first choice was likely always the NDP that the party wasn't necessarily fated to resume its status post the 2015 election as Canada's third party. Anything might happen and in Alberta it did. Polling over the past few months has seen widespread movement towards the NDP. The trend actually started pre-Alberta but it was April to May that saw the big shift. The table below compares my seat projections based on an average of April polls to similar numbers from May. The NDP is now close to overhauling the Conservatives, with the Liberals not far behind in third. The most recent polls suggest something approaching a three way tie in popular vote. This even split in turn has sparked a renewed interest in the topic of strategic/tactical voting (tactical is the more precise term) and the prospects for coalition government post election. Much of the interest comes from the fact that a significant percentage of the Canadian electorate is strongly dissatisfied with the Harper government. 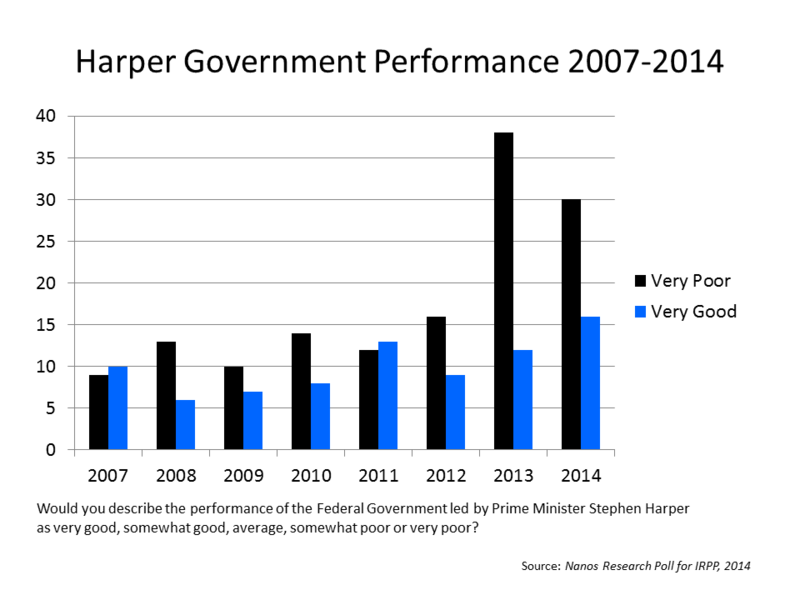 The chart below reporting on eight years of Nanos Polls, suggests that as many as 30% of the electorate rates the Harper performance as very poor, implying that millions of Canadians are willing to vote for the candidate best able to defeat the Conservative candidate in their riding. One can also see rising discontent with the status quo in recent Ekos polls. Neither the NDP nor the Liberals much like tactical voting; both want to be thought of as the real progressive alternative to Harper. Given their previous lead over the NDP, the Liberals have pitched (and continue to do so) the idea that they are the alternative on the centre-left most likely to defeat Harper. My view is that regardless of what the parties think, there is likely going to be a high level of tactical voting come October. It will be, as it has been in the past, a largely grass roots phenomenon. Previous research I have conducted suggests it is likely that voters will make the appropriate tactical choice when the time comes and determine the outcome in many seats. So who will be the best local candidate who can win in your riding? You'll decide. We'll send you information about the state of the race, and candidate positions on key issues. In the ridings where the Vote Together campaign is strongest, everyone who has pledged to Vote Together will collectively pick a candidate to recommend to the rest of the Leadnow community, and then we'll vote together on election day. Having some kind of online consultation and deliberation is not going to be of any interest to most voters who simply want to know which way to vote against Harper without engaging in a complex process. Moreover, there is a risk that this online process could be hijacked by technologically savvy Harper sympathizers in an effort to ensure the wrong choice is made. While I actually doubt the Conservatives would be bothered with Leadnow, let us not forget that in 2011 someone with access to the Conservative voter database interfered with some voters' efforts to cast a ballot (the so-called "robocalls" affair), so you never know. Of course, if the Conservatives drop to third, tactical considerations in voting would largely become moot. And that is not impossible; the Conservatives are not that far out of third now. Even if there were no polls to ponder, one can see many signs of Harper government decay: cabinet ministers leaving politics (Peter MacKay, John Baird, Shelley Glover), new policy initiatives with a last-minute, slightly desperate air to them (new unattainable greenhouse gas targets, a sudden interest in pension consultations, a new small-scale infrastructure program to ensure lots of announcements for local MPs), plus other sources of trouble including renewed interest in the Senate scandal sparked by the imminent release of the Auditor-General's report on Senators' expenses, and last but not least, a shrinking GDP in the first quarter of 2015. The Harper Conservatives are clearly in trouble. The voters are beginning to stir; spring is almost over as a very political summer beckons. 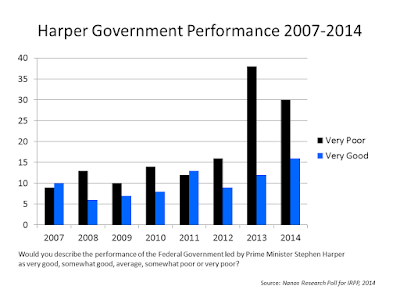 Will the autumn of Stephen Harper's career as prime minister be far behind?